Like many overlanders, there was a time a few years ago when the allure of a roof top tent spurred me to search for the perfect specimen, something that would be quick to set up, offer comfortable sleep, and hopefully endure years of hard use. I thought I found the perfect solution, but the setup proved arduous, the sleep quality so-so, and then there were the host of negative attributes I didn’t fully appreciate at the time of purchase. 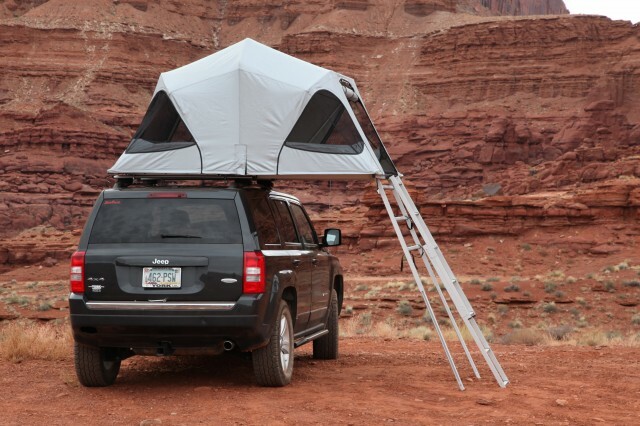 My chief complaint with most roof top tents was relative to weight and collapsed size. Even on my rather large Land Rover Discovery II, most tents sat atop my roof like a pallet of bricks. 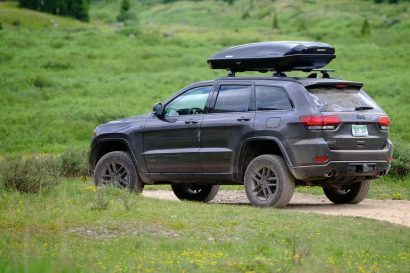 Even the lighter options tipped the scales at well over 100 pounds, and as an avid backpacker, I just couldn’t believe there wasn’t a lighter more compact alternative, one that could be used on a smaller vehicle if desired. Pundits of the then current offerings were quick to tell me it just wasn’t possible to create such a tent, something I knew couldn’t be true. Fortunately, James Baroud felt the same way. 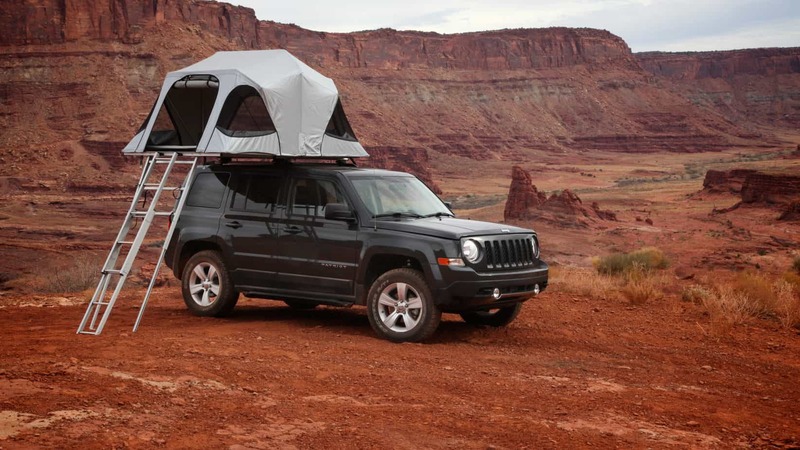 The new James Baroud Horizon Vision is the tent I had been looking for years ago. 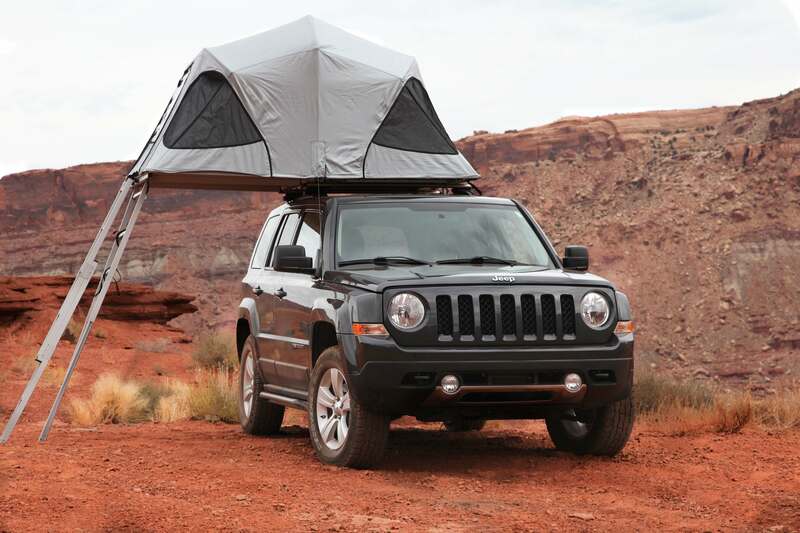 At 88 pounds it is easily 20 to even 50 pounds lighter than similar tents. With a collapsed size of 59x43x9-inches, it is also up to 20% more compact than most of its peer products. We all know, size matters, but there is far more to this tent. Like all James Baroud tents, the Horizon Vision displays a level of innovation and forward thinking that I have come to associate with the brand. 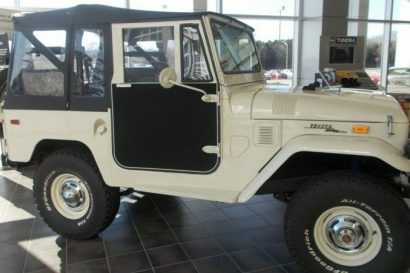 If you haven’t noticed, the roof top tent market is awash with me-too products, most of which are little more than watered down derivatives of decades old models. 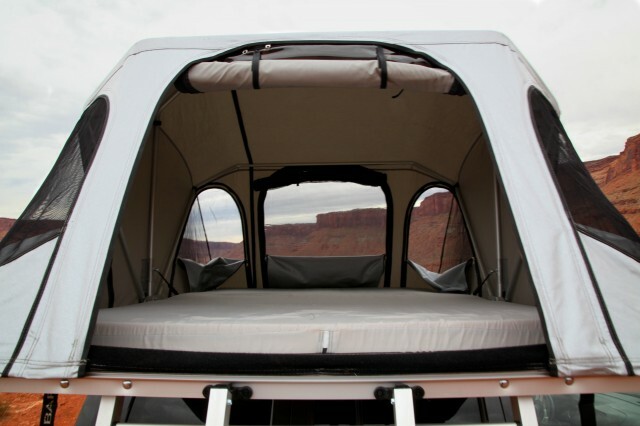 The Horizon Vision is refreshingly different and represents a new approach to tent design. The first soft-sided tent to include hydraulic struts to assist with opening and closing, the Horizon Vision ticks the box for ease of use. Once the cover is removed and the two compression straps released, the tent is effortlessly coaxed from its folded position in one easy motion. 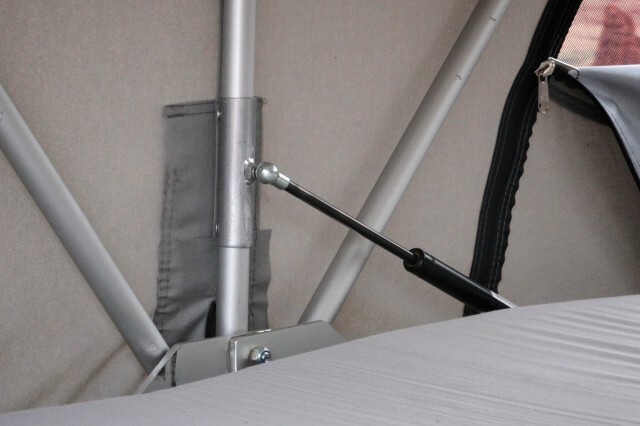 The two support legs snap into place quickly, and with the ladder secured, the tent is fully pitched. From start to finish, I have routinely had the tent sleep-ready in under four minutes, even in the dead of night with cold fingers. There is no rain fly to fuss with, no wire struts to insert, no crank to turn. Closing the tent takes more time, but even then I can get the tent fully stowed in as little as six or seven minutes with no rushing or effort involved. If you opt not to store the ladder atop the tent, the profile shrinks to just 9 inches tall. Once deployed, it’s obvious there is something different about the tent. The most unique feature is the aluminized synthetic fabric. 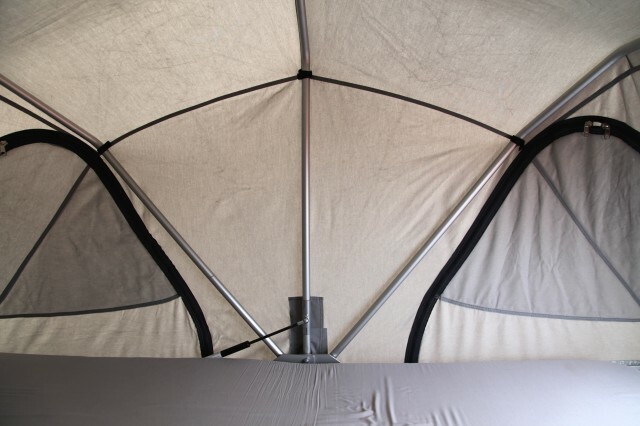 Proprietary to James Baroud root top tents, that heavy-duty fabric is fully waterproof, resists UV damage, and reflects harsh light providing for a cooler tent interior. To further improve internal temperature control, the tent has two full-size mesh doors and four large zippered mesh windows. Not only does this create a pleasant panoramic view, it does wonders for air pass-through on warmer nights. The tent can also be fitted with an insulated liner for use in extreme cold weather. The architecture of the tent is provided by an all-aluminum structure with no use of wood or other materials that could age, weather, or degrade. The rounded shape paired to the stout frame makes the tent steadfast in even the ugliest of gales. In their pursuit to make tents worthy of the most offending environments, each James Baroud tent is wind tested to speeds up to 70 mph. The inside of the tent is quite luxurious with a sleeping platform that measures 59-inches wide and almost 87-inches long. At a touch over 6-feet tall, I have ample headroom with the 47-inch peak height, and laying down my feet and head have plenty of distance from the opposing walls. 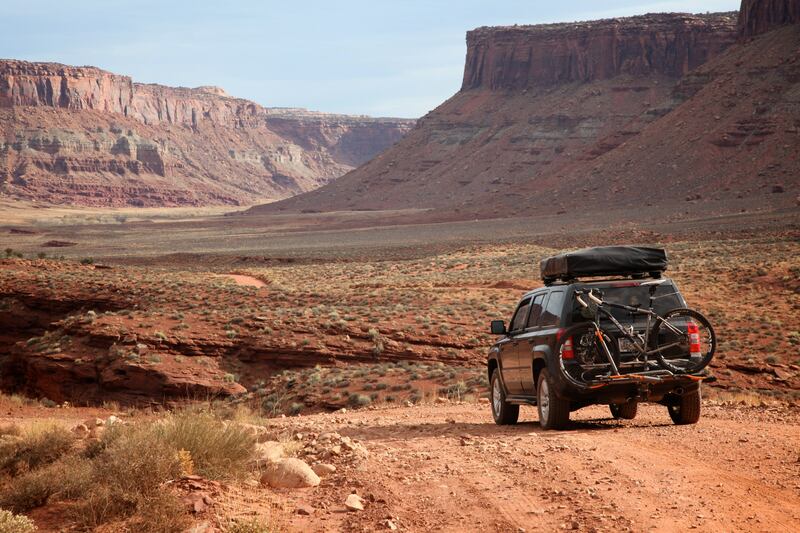 Two adults have more than enough room to move around freely, even with a modest amount of gear stashed in the periphery. There is also a small area of floor space uncovered by the foot of the mattress that I find convenient for storing certain items like shoes and other things I may not want on the mattress. 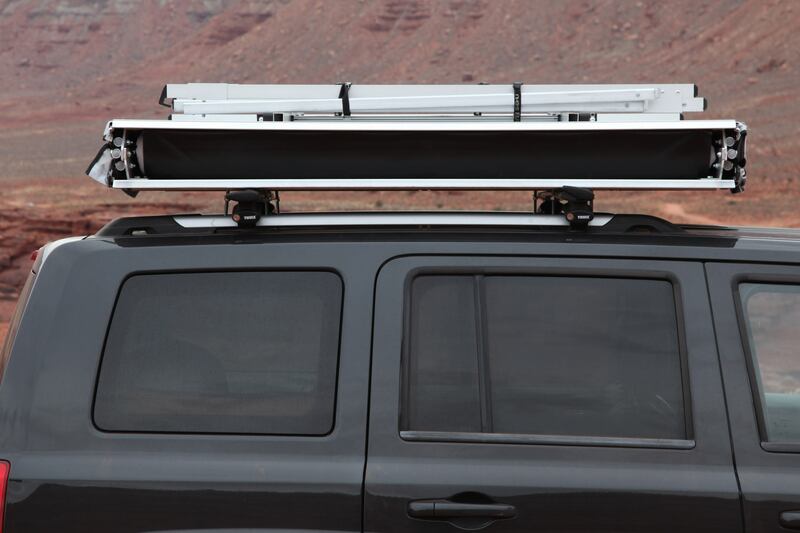 The aluminum framework, assisted by two gas struts, folds into position with minimal effort and creates a sturdy framework for the shell fabric. The outer shell is cut to perfection with no sagging or bunching. 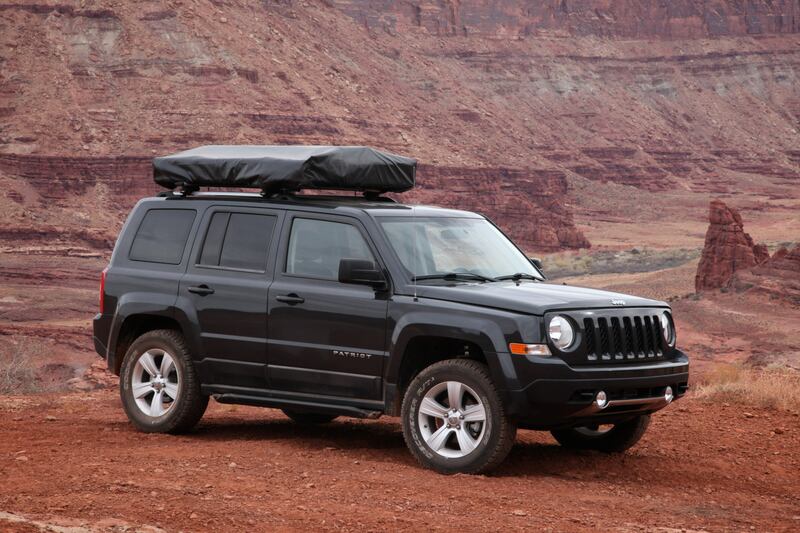 It is a well designed tent, perfectly suited for smaller SUVs and wagons. The lighter weight and compact size feel proportionate when mounted to our Expedition Portal Jeep Patriot and don’t adversely impact handling or fuel efficiency. 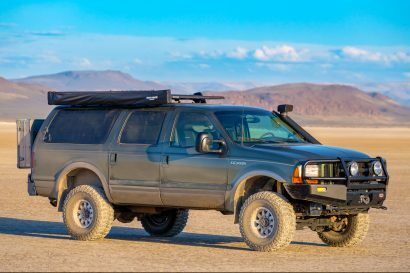 This is not to say it wouldn’t be a great solution for a full-size truck, particularly for those with a smaller roof, or one not well suited to a larger hard-sided roof top tent. Next, we’ll provide a more in-depth review of the installation, setup, and features of the Horizon Vision. Like all of our reviews, we think it is important to put these products to good use to best appreciate the pros and cons. After our first two months with the tent we can say with confidence, it is long overdue and quite impressive––but we somewhat expected it to be.